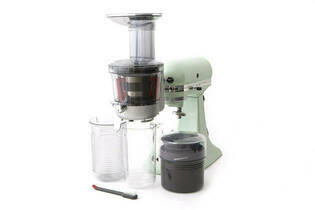 Snapshot: The KitchenAid KSM1JA cold-press juicer attachment is compatible with some KitchenAid stand mixers. But how well does it juice? Very good results for orange juice. Good results for apple juice. OK results for green leafy juice. Has three pulp screens for making sauces and jams. Just OK results for carrot juice. Somewhat difficult to assemble and take apart. Juicer stands tall when attached and mixer can be unbalanced. Narrow double chute (fruit and vegetables need to be cut into small pieces). Firm pressure required when juicing. Fiddly to assemble the filter basket and auger. Lid requires strength to lock and unlock. Crevice on the exterior where residue can accumulate. Pulp can get jammed around the filter and auger. We processed a kilogram each of carrots, apples and oranges — and a “green leafy” combination of spinach, kiwifruit, pear, cucumber, mint and celery. We measured the quantity of juice produced and checked its texture and consistency. If a juicer claimed to be able to make smoothies, we made a banana, pineapple, mango and strawberry smoothie. The smoothie score doesn’t contribute to the juicing score. We assessed how easy and safe it was to “feed” the juicer, assemble and take apart, collect the juice, remove the pulp, and clean the juicer. We also checked whether juice dripped out of the spout after processing, and whether there was any splashing or leaking while juicing. We also measured how noisy the juicers are but this doesn’t contribute to the overall score. Yes (may not be applicable to all parts). 1-year warranty. Compatible with some KitchenAid stand mixers.